Thundering through the Autumn colored forest in Ontario, Canada, the Chippewa Falls has increased in size as the Chippewa River becomes flooded after a thunder storm. As the Chippewa River rapidly flows, it will take with it anything it finds in its path including trees, bushes and tossing around massive boulders beneath the surface. The Chippewa Falls are stunning to see when they are running at their usual pace where the water cascades over the rock ledges for about 20 meters. When the Chippewa River is at its lowest point, the falls spread out between the banks and create various smaller waterfalls. As beautiful as the Autumn colors of the forest are, people visiting the Chippewa Falls after a massive amount of rain, should stay clear of the banks as the river can easily take one downstream with it. The flood will subside once the weather begins to clear and the Chippewa Falls and river will return to normal heights. Picture of the Chippewa River raging through the forest hues after a Autumn flood at the Chippewa Falls in Ontario, Canada. 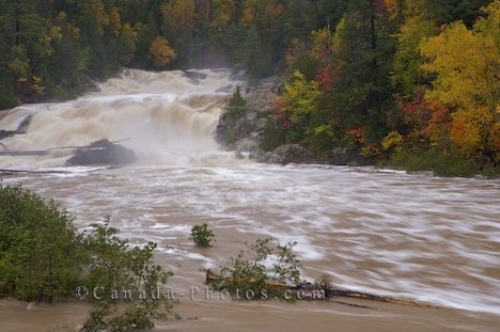 Chippewa Falls along the Chippewa River in flood after a fall thunder storm, Ontario, Canada.